No matter how much other foods may try to horn in on the Super Bowl madness (Tacos? Seriously, Taco Bell? ), wings are the nosh of the day. I won’t argue with that, since I have some expertise in the wings field. But you can’t fuel the multiple hours of pre-pregame, pregame, game, halftime, postgame and post-postgame solely on wings. There aren’t enough chickens in the world for that. This salad is a favorite at every party I host, whether it’s sports related or not. It’s simple, and you can make it the day before the game. It will also lend an air of healthy eating to the proceedings, alleviating any possible guilt about having that 14th wing. It’s from my book, “Fan Fare: A Playbook of Great Recipes for Tailgating or Watching the Game at Home” published by Harvard Common Press. Bring a large pot of water to a boil. Place the sliced onions in a colander over the sink. In a small bowl, stir together the oil, vinegar, salt and pepper until combined. Stir in the garlic. Set aside. When the water comes to a boil, add the green beans. Cover and cook for 5 to 10 minutes, just until the beans are bright green. Do not overcook. Pour the beans and hot water over the onions in the colander. Rinse under cold running water to cool down. Drain well for a few minutes. Place the beans and onions in a large bowl or large recloseable plastic bag. Pour in the dressing and mix with the vegetables. Refrigerate for at least 4 hours or overnight, stirring or shaking occasionally. Serve cold or at room temperature. Be prepared with the right kind of fuel for the long month of madness that is March. It’s been a long season, basketball fans – longer for some than for others, if you get my meaning; and, yes, I’m feeling…blue… But my secondary favorite from my hometown of Winston-Salem, N.C. Wake Forest University, is still alive. All of us must maintain our strength. The traditional food that stokes basketball fans is wings. Usually, hot wings, obtained greasily from some dubious take-out emporium. People, you can do so much better. And your favorite team deserves better. It is so easy (and less expensive) to prepare your own wings. Whether fried, roasted or grilled, there’s a world of flavor in this little package. Save even more by purchasing whole wings and cutting them into parts yourself. It’s easy: Cut at each of the three joints with a sharp knife. Discard the pointy flapper. 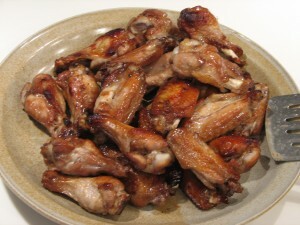 Here’s one of my favorite easy recipes for mild-but-flavorful wings that will please the crowd around the TV. Just don’t let them throw the bones at the set to protest bad calls. The recipe is from my cookbook “Wings: More Than 50 High-Flying Recipes for America’s Favorite Snack” (John Wiley & Sons, 2009). Add more cayenne if you like heat or remove it if you don’t, although this recipe is not hot. In a small bowl, stir together the hoisin sauce, orange juice, ginger, garlic, honey and cayenne. Set aside 3 tablespoons of the sauce. Place the wings in a large reclosable plastic zipper bag. Pour the remaining sauce in over wings and coat them well. Refrigerate the wings in the marinade for 2 to 3 hours.